It's perfectly normal for a healthy, sound horse to trip on occasion. Most tripping incidents are the result of an unseen hole or bad footing in the area where you are riding. If your horse trips on a regular basis or trips severely and falls, it is time to enlist the services of your farrier and your veterinarian to determine if there is a medical cause. Your horse needs to have his feet trimmed by a professional farrier approximately every six weeks. If you miss a farrier appointment, go longer than six weeks between appointments or have a horse with flawed feet, tripping may occur as a result of overgrown, cracked, flared, incorrectly angled or sensitive hooves. Horses who have gone months or years between receiving farrier care may appear lame, short-strided, stumble and trip on a regular basis. The good news is that regular hoof care will correct the problem. 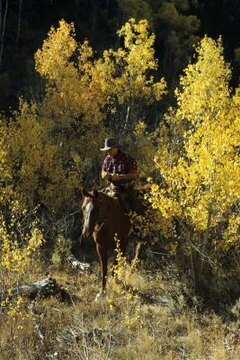 Your tripping or stumbling horse may have problems that you cannot see. A horse who has a history of laminitis (founder) may be suffering from a rotation of the coffin bone inside his front hooves. This condition can cause stumbling or tripping, especially if your farrier is not tailoring your horse's hoof trimming routine to accommodate the pre-existing problems. Horses who have been diagnosed with navicular disease also may exhibit tripping and stumbling, especially if they have gone through any type of medical procedure designed to dull or severe the nerves in the hoof. These procedures are done for pain management but often result in a somewhat clumsy, stumble-prone horse afterward. Horses with any type of degenerative knee problem or knee injury may stumble as a result of their inability to use the joint without pain. Horses may stumble if they have severe arthritis or tendon injuries in their front legs. Your veterinarian will have to examine your horse's legs to determine the extent of your horse's injuries and determine whether tripping is the result of any present or past injuries. In some cases, X-rays may be necessary. Many riders do not realize that badly fitting, pinching, painful or otherwise uncomfortable saddles, girths, splint boots, bell boots or other equipment can cause a horse to alter the way he moves. In some cases, a badly fitting piece of equipment can hit pressure points or aggravate injuries. If you notice your horse is only stumbling when you ride him, check your tack for fitting problems. A saddle that pinches the spine can prevent your horse's back muscles from moving freely and may cause stumbling as your horse tries to avoid pain.